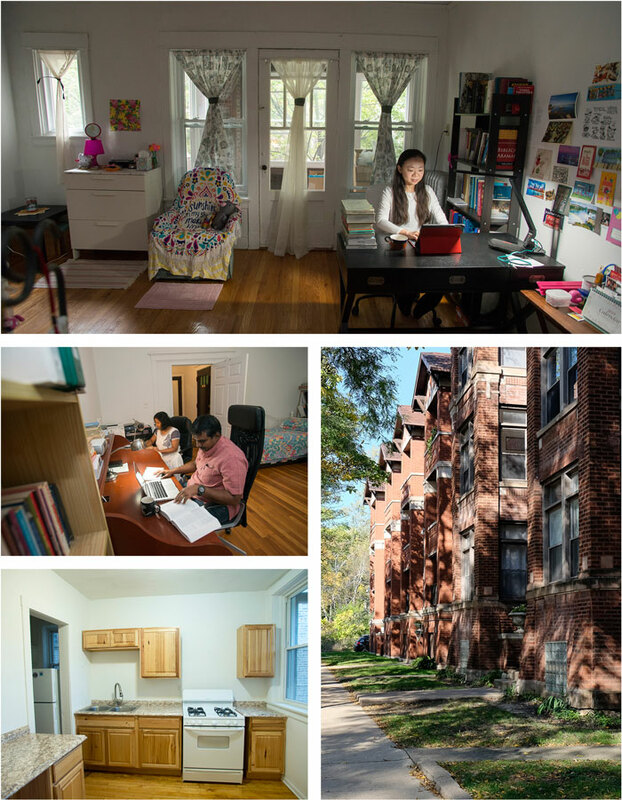 Students at LSTC may be housed in one of our 129 vintage apartments. These one-, two- and three-bedroom apartments may be rented by individuals or families, or shared with other students. Even pets are welcome in our private apartments. Our residential community is located one block from the main campus building, and is ecumenical by design. Students from other area seminaries and divinity schools live right alongside LSTC students. Our housing distinguishes LSTC from other seminaries, and adds to our residential, community vibe. Our apartments are provided at significantly reduced rates, making it possible to live in one of Chicago’s most popular neighborhoods. Nestled in beautiful Hyde Park, students enjoy both the perks of urban living and a small-town feel. Whether exploring downtown or walking the tree-lined streets surrounding our campus, our apartments and close-knit community make it easy to call this large and diverse city your home. Please see our Tuition and Fees page for information on housing costs. What can you tell me about the neighborhood? Like Hyde Park itself, you’ll experience diversity in just one block. LSTC students, faculty and staff live side-by-side in our apartments and on our block. We have a large population of University of Chicago students as neighbors, as well as long-time Hyde Park residents. Can I bring my family, even my children, to seminary? Of course! We have a number of children in our housing, including those of international students. Two public schools are nearby, in addition to other private and parochial choices. One of our five courtyards is the Creation Courtyard with a shared playground. If your family includes a pet, it is welcome, too (for an annual fee). What additional housing costs will I need to consider in my monthly budget? We have shared laundry facilities (at extra cost), and you’ll need to pay for your own cable, phone and Internet. All basic utilities (gas, heat, electricity, water) are included. What does “unfurnished” really mean? There is no furniture, nor are there window coverings. There are basic appliances for the kitchen: oven/stove and a refrigerator. We have radiator heat, but no air conditioning or ceiling fans. International students may purchase a basic furniture package through the International Student Services Coordinator. What do you mean by shared apartment? A shared apartment means you occupy a private bedroom within the apartment, and that you share a bathroom, common living space and kitchen. Some students choose their own roommates and others allow the housing office to place them. Roommate assignments occasionally change or are modified through the Housing Office based on needs of the residents. If occupancy changes for any reason, you are responsible for only your costs. What’s parking like if I bring my car? Street parking is available, and we have a parking garage that can be used at a modest fee. Public transportation is always an option. Bike storage is available in all housing areas, and we have a bike share program. When will I hear about my housing assignment? For all applications received by May 15 for the coming year, students will be notified by June 15.